Written by Catherine Saxelby on Tuesday, 14 August 2012. 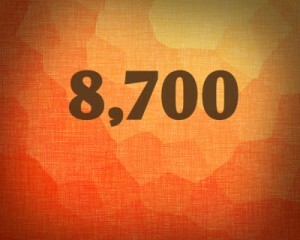 8,700 is a magic number in nutrition. It’s the number of kilojoules (kJ) that is the “average” intake for adults in Australia, if the surveys are correct. It’s widely used as a benchmark figure and as the basis of food labels such as the Percent Daily Intake values. Recently kilojoules have appeared on fast food menu boards and they use 8,700 as the yardstick to assess their foods against. Here's my take on it. Obviously 8,700 kilojoules a day is an average. The actual number of kilojoules you need will vary depending on your age, gender, life stage (if you’re growing or are pregnant as this calls for more energy), weight, height and how physically active you are. A very active 16-year old, for example, requires 12,000kJ a day, which is 4,000kJ more than a sedentary 70-year-old. And then there’s that wonderful thing known as genetic inheritance. Most of us know people who always ‘burn off their food quickly’ and rarely put on weight –they most likely come from a family with a similar metabolic tendency! The Legends pizza ad shown has 6654kJ in the whole pizza which becomes 832kJ per slice or wedge. Think if this is a realistic serve size - would you eat one-eighth of a regular pizza? Unlikely. You'd probably tuck into half of it (3327kJ) or at least two wedges (1664kJ). In the old numbers, 8,700 kilojoules is equivalent to 2,080 Calories. Or simply round it off to 2,000 Calories for ease of remembering. Who should aim to eat 8,700? Women between 19 and 50 doing light activity and who weigh between 55 and 60 kg. Women between 51 and 70 doing light activity and who weigh between 60 and 65 kg. Women over 70 doing light activity and who weigh between 70 and 75 kg. Men over 70 doing light activity and who weigh between 55 and 65kg. Girls around 12 or 13 doing light activity. Boys around 11 or 12 doing light activity. Your individual circumstances will dictate whether you need either MORE or LESS than 8,700. Click here for a full table of recommended daily intakes for kilojoules. Or see an Accredited Practicing Dietitian for more personalised nutrition advice. The cheesecakes shown above give you the kilojoule counts for the whole cake. You'd have to divide that figure by 8 or 10 depending on the number of serves you cut. These counts must be on their website, order forms and promotional fliers. How much food does 8,700 represent? Here’s how a typical food day could look like to add up to around 8,700 *. * Figures have been rounded to the nearest 0 or 5 for ease of reading. Figures calculated using Foodworks 6.0. If you eat a lot of fast food, it won’t take you long to reach 8,700 kilojoules, Check out this day’s meal intake below and you’ll see that only six fast food items take you to your 8,700. Take note: Lunch doesn’t even include the ubiquitous “fries with that”! Where does the figure of 8,700 come from? It comes from national surveys of what Australians supposedly eat. According to Food Standards, we eat, on average, around 8,700 kilojoules a day. This figure of 8,700 MUST be stated somewhere on fast food menu boards. See the cookie example above from Subway. See how each cookie has its kilojoule count displayed PLUS there's the average adult intake of 8,700 along the base. Yes, it's epic all right! This Bondi Burger gives you 35% of your day's suggested total. Divide 3,180 by 8,700 and you get 35%. Ask yourself - do I want to eat 35 per cent of my total intake in one item? The 8,700 website of the NSW Food Authority outlines the new laws requiring fast food operators to display the kilojoule counts on their menus.